Yes, Adapalen is a retinoid and retinoids speed up the turnover of the skin which does speed up the diminishing of acne spots or other spots. Try to eat healthily and eat a wide variety of foods. Reduce your intake of carbohydrates or at least sugar and starches. Include nuts, seeds, avocados, vegetables, meat, fish, beans, lentils, eggs, olive oil, moderately dairy products, fruit in moderation. Completely stop with sugary drinks. If you cannot resist, dilute them with water. For the rest, I am not a doctor and I cannot make any diagnosis. If you feel OK in general, there is probably no serious problem. Concerning dermarolling, I always recommend doing a test patch to see how your skin reacts and how long it takes to heal. Itching or irritation is a relatively common side effect of retinoids , especially initially and it is neither a good or really bad sign. If it doesn’t get better with time, retinoids are not for you. Some people just don't tolerate retinoids well. Before I answer your questions, in your case, with so many stretch marks, you would really benefit from our new product, the electric DermaJet. It has an adjustable needle length from 0.2 mm to 2 mm and adjustable speed. 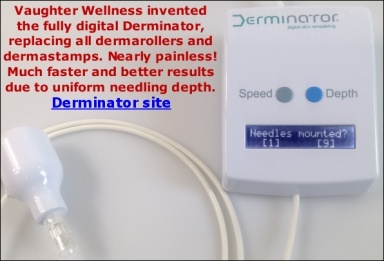 Manual single needling or stamping will do the same job but for those having many stretch marks, the Dermajet will do it much quicker and easier. Replacement needle cartridges are $9,- and are re-usable after disinfection. Always start with 0.5 mm needle length and later, according to bleeding, healing time and pain, you can go for a longer length. The inner arms and the armpits have relatively thin skin and a 0.5 mm needle length is probably the most appropriate with the Dermajet because it powerfully pushes the needles in so it goes deep. No, you cannot replace Chloramine-T with bleach. Concerning disinfection, it is much more important to clean (remove skin debris) and disinfect the dermarolling instruments after the session than cleaning the skin before the session. The only problem is in case of immune deficiency (AIDS, taking immune suppressants for cancer treatment, having a very serious illnesses, right after major surgery, being on one's deatbed etc.). Infadolan is in a tube so nothing can get in. The only think to perhaps care about is not to store cotton pads or dermarolling instruments next to a toilet bowl that also other people use. (microdroplet spray). For the rest, you do not have to worry. There is no need to soak your instruments in alcohol during the session, you should clean it and soak it when the session is finished. You can put it on a piece of clean paper for example. There is a huge difference between the necessity for sterility when operating on someone, vs. you rolling your skin. There are many crucial differences that I have already explained several times on this forum. There are dermarolling users who do not even bother to disinfect the instruments (they just rinse it with water) and still there are no floods of infection reports on the Internet in spite of hundreds of thousands of dermarolling users (I am in no way or shape promoting to slack on disinfection!). I will answer the rest of your questions when you reply because if you decide to buy the DermaJet, there is no need to use a dermastamp and the single needles any more. You would be definitely a good candidate, but always start first with the 0.5 mm needle length (wherever you use the DermaJet and for whatever skin condition) and from there, according to bleeding, pain, healing time etc., go for longer needles. Also, on the face, do a small test patch first to see how your skin reacts. Also, always start with the slowest speed. Dermaneedling the skin of bodybuilders is tricky and painful because they have almost no "cushioning" fat under the skin. Buy a regular 1.5 mm dermaroller and, a 1 mm dermastamp and our 0.1% Tretinoin cream. overproduction of oily sebum (this clogging causes acne). Nevertheless, you do not have to use a dermaroller to prevent acne. Try salicylic acid. Salicylic acid is useful for acne and blackheads-prone skin because it has a comedolyitic (de-clogging) effect. It penetrates the pores and disrupts the sebum that plugs them. Many have good experience with using Benzoyl Peroxide. Our Tretinoin creams also help keeping acne under control. The only advice I can think of is to try a broad spectrum antimicrobial agent because in spite of your negative result, you cannot completely exclude infection. Wait for your allergy test and if it is negative and none of your doctors figures out what you have, buy Betadine liquid or Betadine ointment (containing Povidone-iodine). Povidone-iodine exhibits a broad range of microbicidal activity against bacteria, fungi, protozoa and viruses. Apply it to the skin and let it work for about half an hour. If it doesn't help after trying it twice, there is no pint doing it more. There are some antibacterial and antifungal creams for sale OTC. If you are really desperate, try it on the affected skin on the legs. > or behind the knees? Please do not start with long needles when you use a DermaJet. The DermaJet pushes the needles into the skin with quite some force due to its power so the needles really penetrate as deep as they can go. Initially, adjust the needle length for 0.5 mm and later, when you know how much the area bleeds and how painful it is, you can go for the 1 mm size. This advice concerns all areas. Start with the 0.5 mm. The upper arms areas and behind the knees are thinner than elsewhere and a 0.5 mm length might be all you can go for without getting bruises. This is individual because skin thickness varies a little individually. >my upper arms, for instance, are thinner and there are only a few. In this case, use the 12-needle cartridge for other stretch marks and wait with the upper arms until we have our customized 5-needle cartridge and 1-needle cartridge. It will cost 9 dollars and you can reuse any needle cartridge if you disinfect it after each treatment. I have to re-write that part. What I meant is that the DermaJet is very useful for those with an extensive number of stretch marks or scars and is also useful for rejuvenation but for example in case of sun damgaed entire décolleté or skin laxity all over the legs, doing it all with a Dermajet will take a long time and it is quicker to roll such extensive areas with a dermaroller. That's just because it takes only a couple of seconds to roll a long 2 cm wide strip of skin with a dermaroller. If you use a Dermajet, there is no need for single needling or dermarolling. Thank you for reporting this and thus help the others! It does not really matter because the only difference is that the 400 mg capsule contains twice the contents of a 200 mg capsule. If you buy 10 capsules of 400 mg, you will get twice as much liquid than if you buy 10 capsules of 200 mg. That is all. When you pierce the capsule, do not apply the entire content of the capsule on your hyperpigmentation (unless the hyperpigmentation area is very large). Apply just a few drops. Keep the capsule and apply every time a few drops until the capsule is empty. Dermarolling / Microneedling / Re: What part of cheek should I avoid dermarolling if scars are multiple/spread? The advice only concerned rolling with 2 mm dermaroller over the pores right next to the nose. Rolling over scar-less skin is absolutely no problem. In case of scars, you should definitely also buy a 1.5 mm dermastamp with 35 needles and combine it with dermarolling. During the same session, stamp the scars and then roll the entire area. You do not have to treat your entire face in one session. Treat one cheek, when it heals, treat the other, when it heals treat the forehead etc. You can continue rolling when it bleeds and you can also wipe the blood off with a cotton pad slightly wetted by tap water. When the session is finished, clean your face with tap water, let dry and apply something moisturizing. As we explain in our dermarolling instructions, disinfecting the instruments after the dermaneedling session is much more important than disinfecting the skin before the session. For the time being, buy just a 1.5 mm dermastamp with 35 needles and needle your scars every three weeks. (You can also buy the single needles and combine them but a dermastamp is enough). After six months of dermastamping, write again and we may add something else to your dermaneedling routine. Apart from a few scars, your skin texture is nice and your skin tone is even. You do not have to stamp all your scars in one session. Stamp one cheek, when it heals, stamp the other. For your clogged pores and oiliness, buy our Tretinoin cream.